The first experimental evidence of a Majorana fermion in Delft 2012 led to a wave of scientific enthusiasm: control of such particles is a holy grail in quantum science and technology. Quantum chips based on Majorana fermions promise error-protected quantum computations. 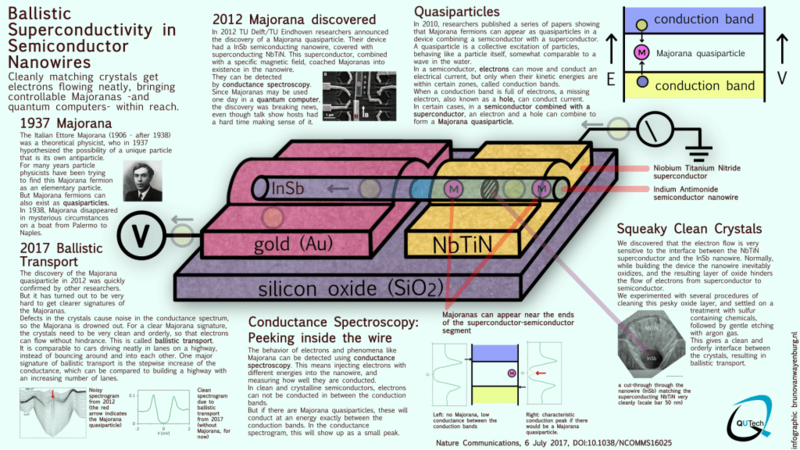 However, the fabrication of Majorana devices is an extremely challenging task. A collaboration of researchers has now combined state-of-the art nanowires with a high-quality interface to other required materials on a chip. This allows for bullet-like collisionless quantum transport of charges through the nanowires: a requirement for larger-scale Majorana experiments. The novel methods open doors towards quantum computations based on Majorana fermions, allow for the exploration of new quantum effects in such materials and can have future applications in energy-efficient electronics. See the infographic made by Bruno van Wayenburg for all interesting details of this novel quantum chip and its future applications.